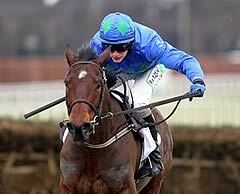 Hurricane Fly landed his fourth consecutive BHP Insurance Irish Champion Hurdle at Leopardstown in a thrilling finish. Sent off the 4-7 favourite as he again took on young pretenders Our Conor and Jezki, he was settled in second by Ruby Walsh as the veteran Captain Cee Bee took them along in the Grade One contest. Hurricane Fly led at the top of the straight, but he was hard pressed by Our Conor at the final flight and although he wasn't fluent over it, he found most on the run-in to beat off his rival in a pulsating climax under a jubilant Walsh. Captain Cee Bee held Jezki for third. It was an eighth victory from as many starts at Leopardstown for Hurricane Fly, who was also matching Istabraq, the only previous four-time winner of this race. Walsh said: "I just rode the race as I found it. In fairness to Hurricane, he quickened up well. He wasn't great at the last, but when I got serious with him he found plenty. Stamina was never going to be an issue with him." 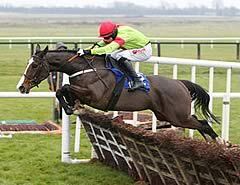 Hurricane Fly is the 3-1 (from 10-3) joint favourite with Coral for the Champion Hurdle, after his success today. The New One is the other 3-1 market leader, with the beaten horses and Leopardstown this afternoon, Our Conor and Jezki, 7-1 and 10-1 respectively for the Cheltenham showpiece. “Hurricane Fly confirmed his superiority over his fellow Irish-trained hurdlers with his Irish Champion Hurdle victory, and now surely only the English challengers The New One and My Tent Or Yours can prevent the Fly completing a Champion Hurdle hat-trick,” said Coral’s David Stevens.